Can you Adam & Eve it! Our one-time-only fav celestial aqua shaded lunar themed eatery is back! 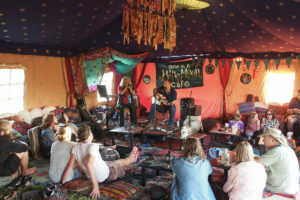 Yes, of course we are talking about Once In A Blue Moon Cafe, which is returning for 2019 with even more activities and excitement on offer (including the open mic stage!!) This lovely café appeared for the first time at USTf last year and with all the rave reviews we simply couldn’t wait until they applied again, our fingers were already hovered over the keyboard buttons Y E and S.
Once in a Blue Moon Café is a nomadic food & drink, music, arts and wellbeing space. They create such a welcoming environment in which to relax with a hot drink and a delicious bite to eat and take part in various workshops. 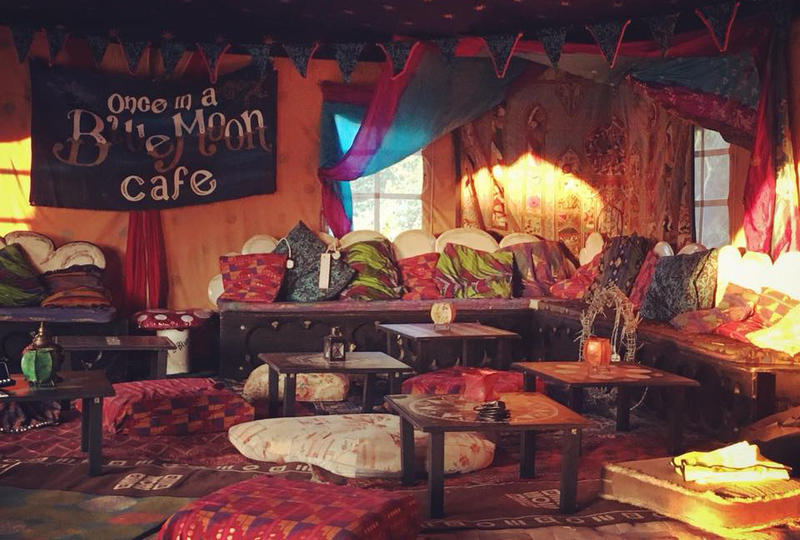 We caught up with the lovely Helyn from Once in a Blue Moon Café a couple of weeks ago to discuss all the exciting things that they are bringing to the festival this year. We are thrilled to announce that they will be hosting the Blue Moon open mic stage which is BRAND NEW for 2019. Lots of you have asked for a space and we are pleased to be able to offer you one. This is a fab platform for any audience members who fancy getting up either on their own or with others. The performer is provided with a microphone which is plugged into a PA system. This doesn’t have to be music either, if you want to try stand-up comedy or you are a professional who wants to try out new material, please do come forward! With that kind of reward, the UTSf team are definitely considering putting a troupe together. One of us is currently rummaging through the garage to find that old penny whistle. Another is climbing on top of their child’s wardrobe, looking for a pink recorder they have told us they have. And another has surprised us all with a very impressive tune on a Fluba which they got out of the boot of their car! Ha ha! We are of course kidding… it was a stalacpipe organ! So yes, there is the open mic stage to look out for! Eeeekkkk! 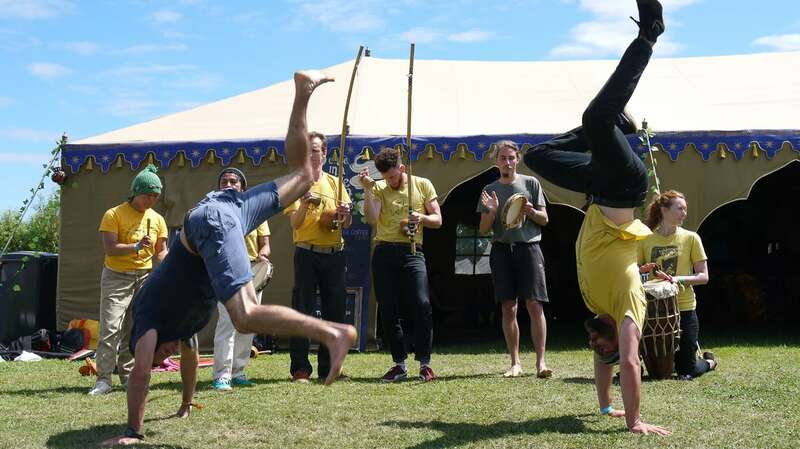 But don’t think it stops there… They have all sorts lined up such as Skovva Upcycling, Natural Movement classes, Capoeira Angola Martial Arts, Yoga, Hang Drumming, Creative Writing, Meditation and Children Arts and Crafts. If you are wondering what some of these are, click here to find a full explanation. 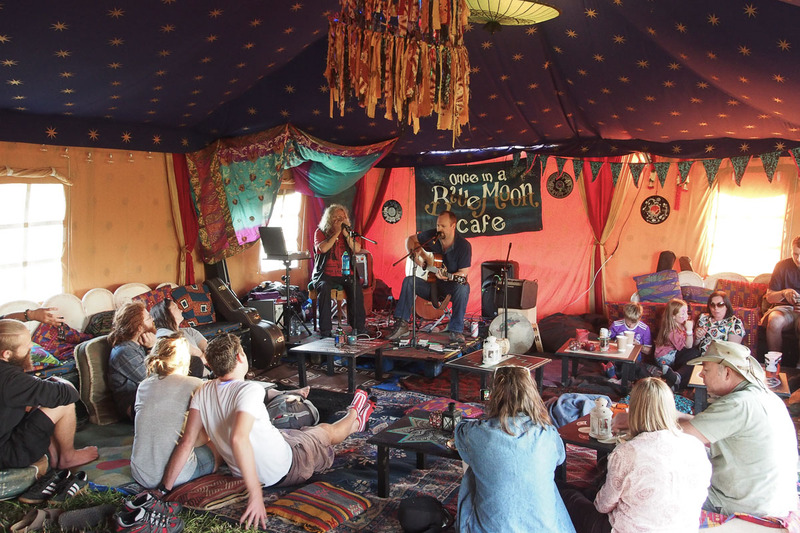 It is clear that Once in a Blue Moon Café has made a huge impression on our festival. 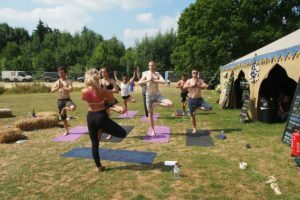 It has delighted audience members who have wanted a space to go and relax, to chillout away from the hustle and bustle of the festival. It’s not only a place for high quality food and drink, but it is a beautiful and spacious area for festival goers to try something new. OIABM celebrated its 5th birthday this year, (hurrah, Happy Birthday!) having come a very long way since they started out by selling homemade cakes at the Stone Henge Summer Solstice. Their first festival appearance was, in fact, at the Stone Circle at Glastonbury Festival where they arranged a guerrilla ‘cafe’ and traded tea and biscuits for poems, trinkets and good company. How wonderful! Their food and drink is lovingly prepared fresh on-site and sourced organically, locally and ethically. 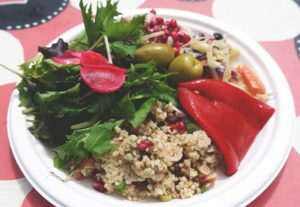 Since day one, they have always used organic fruit and veg with over 90% of the ingredients in the cafe being organic. 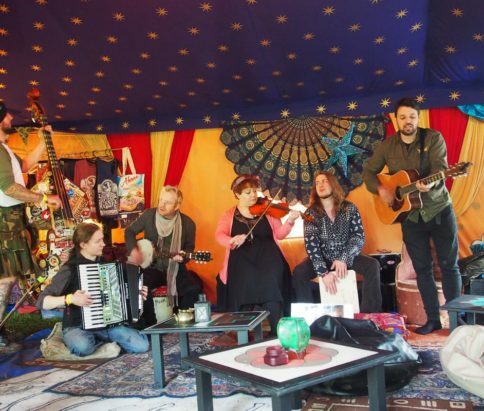 For anyone who came to the festival last year, you will know what we mean when we say how stunning the tent was to walk into. Every little bit of the space was so well thought out. When we asked Helyn about this, she replied, “it’s crazy to think that our benches were designed in a café, on a chai stained napkin at 4 in the morning! Some of the best ideas come to us in the early hours of the morning. Almost all of the signs and décor in the café are made from reclaimed wood and old clothing. It is so important for us to re-use and recycle as much as possible”. Well OIABM, we cannot wait to have you back onsite and don’t worry, we will get our performance ready for your stage! It is a delight to have you all return for 2019 and we look forward to everything you have to offer. Hurrah!